This month the Poppins Book Nook Virtual Book Club topic is Caldecott Medal Books. 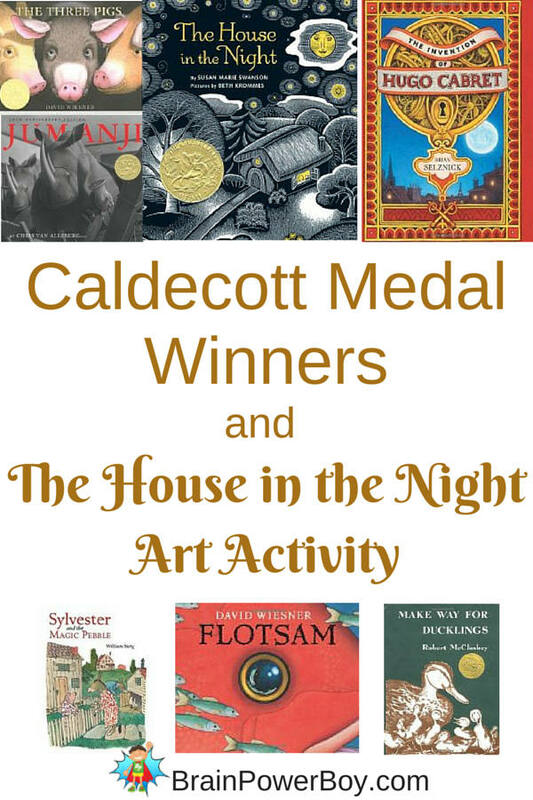 Are you familiar with the Caldecott award? The Caldecott Medal is a spin-off from the Newbery Medal Award for excellence in American children’s literature. Someone became concerned that the artists illustrating books were not being properly recognized. The award is named after illustrator Randolph J. Caldecott and is given each year to the artist/illustrator who created the most distinguished picture book of the year. We dug through the medal books and found some that we thought were the best books for boys. We think reading is important and we have done a lot of book lists for boys. Because, after all, that is what we do – provide resources for raising boys who love to learn. Here are our selections and the book we picked for this month’s book activity. We will start this list with The Three Pigs . I am a big fan of David Wiesner. If your boy likes stories that are take off of the original, he will really get a kick out of The Three Pigs. The pigs actually escape from the book and adventures follow. Mr. Wiesner’s illustrations are awesome and he has a fantastic sense of humor as well. Our favorite wordless picture book of all time is also a Caldecott Medal winner and it is also by David Wiesner. We love his book Flotsam (LOVE it!). This book is a winner on so many levels. Great for kids who love to use their imaginations and for those who like the think that maybe, just maybe, there could be turtles with cities on their backs living in the sea. A wonderful story that you simply can’t miss. Highly Recommended! Sylvester and the Magic Pebble is a classic children’s storybook. It is a book about magic pebbles and wishes and the situation that Sylvester accidentally gets himself into while pursuing his hobby of collecting pebbles and making an interesting discovery. Oh, this book takes me back. I have read it so many times. My son is an animal lover and this book is a family favorite. Make Way for Ducklings won the medal way back in 1941! It is charming and a simple delight. All about Mr. & Mrs. Mallard trying to find a nice safe place to lay their eggs and raise their ducklings with a few interesting twists. I like Snowflake Bentley for many reasons but the main one is that a little boy had a fascination with snowflake photography and his parents supported his passion. We wrote more about this book in our non-fiction books about snowflakes list. I wanted to include a book for older boys and here is the one we chose. The Invention of Hugo Cabret is a feast for the eyes. Unbelievable illustrations, a notebook, a secret key and more keep this story moving. If you have a boy who likes mysteries give this one a try. It is a thick book but don’t let that put you off as much of it is filled with illustrations. What if one day you found a game and when you played it whatever happened on the board came to life right in your living room? Jumanji is that game and this book is a treat (for those who like to think of that sort of thing–do you?). 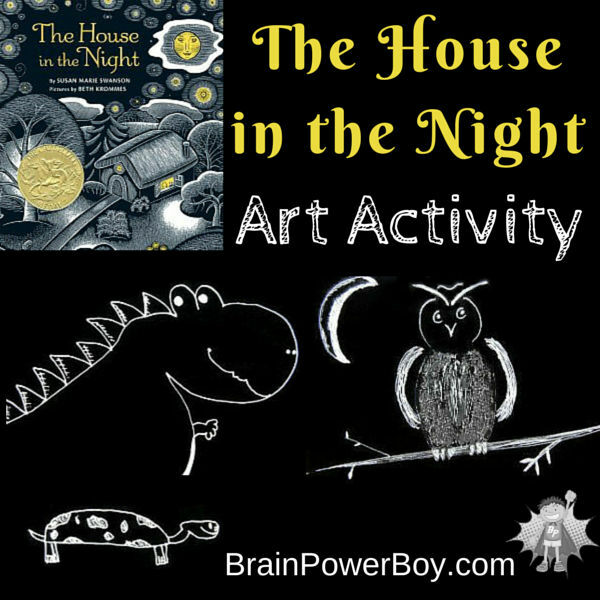 The House in the Night is the book I ended up choosing for the book activity this month. I have read the book many time myself because I simply enjoy the illustration style so much. The story is one that is similar in style to This is the House That Jack Built where you have what they call a cumulative tale. This one starts with “Here is the key to the house. In the house burns a light. In that light . . . ” and so on. But this is no ordinary story and when the main character comes to a book the story really takes a lovely twist. I hope you and your boys find a few good books to read! On to the activity . . . Regarding the art project, the artist used scratchboards. Use these boards , and these tools if you want to work in the same medium. We decided to go with black paper and a white pen for a more relaxed and accessible project. We found that the card stock and the Gelly Roll pen gave us just the type of artwork we were hoping to achieve. Surprisingly, very simple drawings look great done with these materials. The directions for this project are easy. Take black card stock and the white pen and create a drawing. Your goal with this project is to encourage creativity. They can draw anything their heart desires. I am a big (huge, gigantic) fan of open-ended art projects! To make the lines close together use a ruler and shift it down a bit at a time for straight lines. Try cross-hatches to get added texture into your drawing (I really like how this looks). Choose one color to add to the drawing and highlight just a few spots. At the beginning of the book the child is being handed a key and the key and the dogs collar are yellow, everything else is black and white. Be careful not to touch the ink until it dries or it will smear. We drew a cartoon dinosaur, a turtle and an owl to share, plus a whole lot of other drawings. I always find it interesting to try different art materials and explore new techniques. This one is a winner and we will be doing this again–soon! If you and your kids draw something based on this article, please take a picture and share it on our Facebook page. We would love to see what you drew. If your boy likes dinosaurs try our Dinosaur Drawing Books, Dinosaur Q&A book list, or Dino Activities for Toddlers and their Big Brothers. You can also check out all of our books lists and activities for boys. Enjoy! Definitely pinning this and looking into grabbing a few of these from the library this summer. They’ve been reading independently but I really miss reading picture books with them. They aren’t too old yet! Thank you for linking up with the Laugh & Learn. Hope to see you next week! LindseyLoo, I decided when my son was quite small that I would not stop reading to him until he left the house! While the books we read have changed, I still really love having that connection with him. We do still read picture books as well because many are very well done. Nice to meet another duckling fan Alli. Love the story about your grandmother’s bookcase. What a lovely memory. I agree with you that illustrations are important. I seek out books with beautiful illustrations. Wow, thanks! Always a pleasure to link up to the Kid Lit Blog Hop – thanks for commenting. Your post shows a totally new way in seeing Caldecott books. Though, we have already read “House in The Night”, I am thinking of reading again, for the wonderful art idea. Thanks for sharing in Kid Lit Blog Hop. Thank you Ambika. I read The House in the Night every once in a while because I love the illustration style. Thank you for sharing this wonderful selection of books for boys. My youngest grandson’s name is Bentley so I am definitely going to have to pick up a copy of Snowflake Bentley. Glad you linked this post to the hop. Thanks for the nice comment Stacie. Thank you for taking the time to stop by.